By the time Easter nears, eating fish on Fridays can seem monotonous and boring. 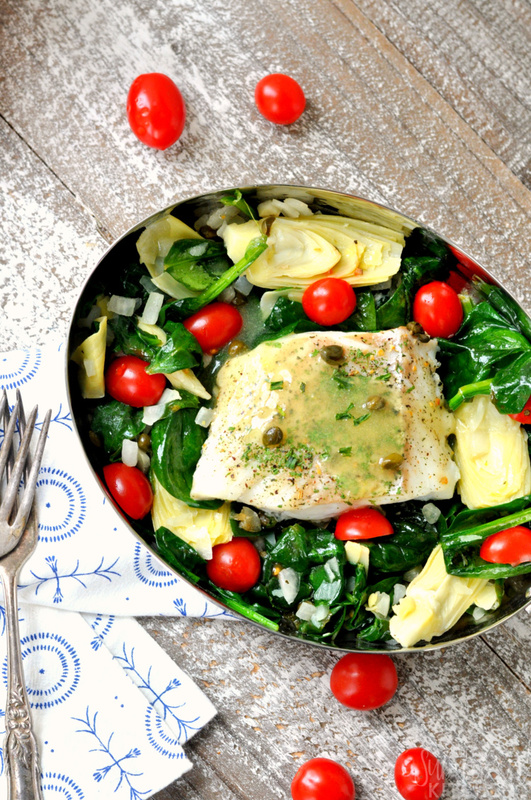 Try this Mediterranean style Alaska cod recipe with spinach and artichokes for a flavorful upgrade to the standard fish Friday offerings. This recipe is so simple and fast to make. It is perfect for any weeknight meal. Even with all of the “green stuff” (a.k.a vegetables), my kids absolutely loved the flavor and I loved seeing them try a healthier recipe. 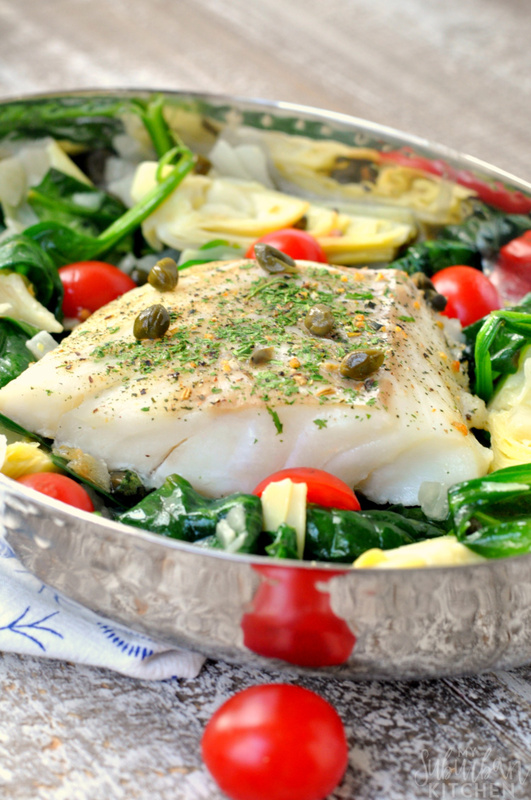 When shopping for cod for this Mediterranean style Alaska cod recipe, I made sure to ask my fishmonger for Alaska cod. 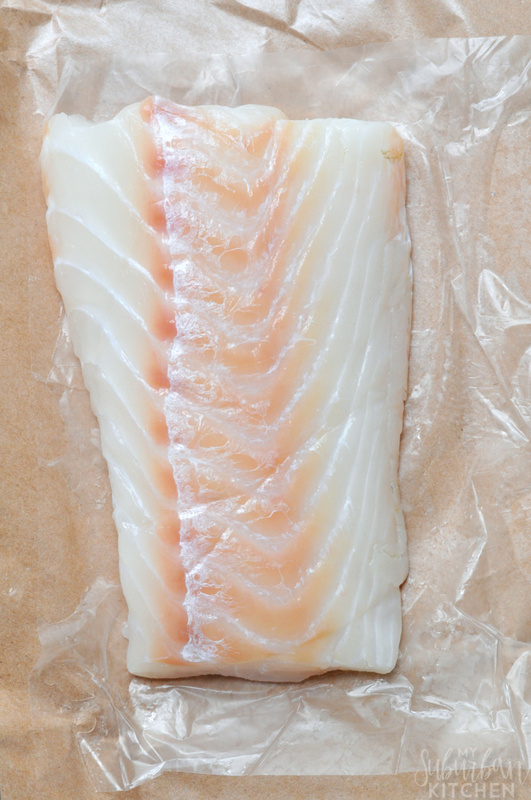 Wild-caught Alaska whitefish, like cod and halibut, are sold fresh and frozen year-round providing lots of possibilities and the ability to enjoy Alaska seafood all year round. With Alaska’s cold, pristine waters, you can expect the purest, high-quality seafood. In fact, Alaska’s wild fisheries contribute nearly 60% of all seafood harvested in the United States. I was a little worried that my kids might reject the dish if they thought the Alaska cod and vegetables were all cooked together (they are a funny bunch) so I cooked the fish in the oven and the vegetable mixture on the stovetop. However, you can very easily combine all the ingredients and bake in the oven with equally delicious results. The key is making sure the lemon butter sauce coats everything before baking if you go the oven route. 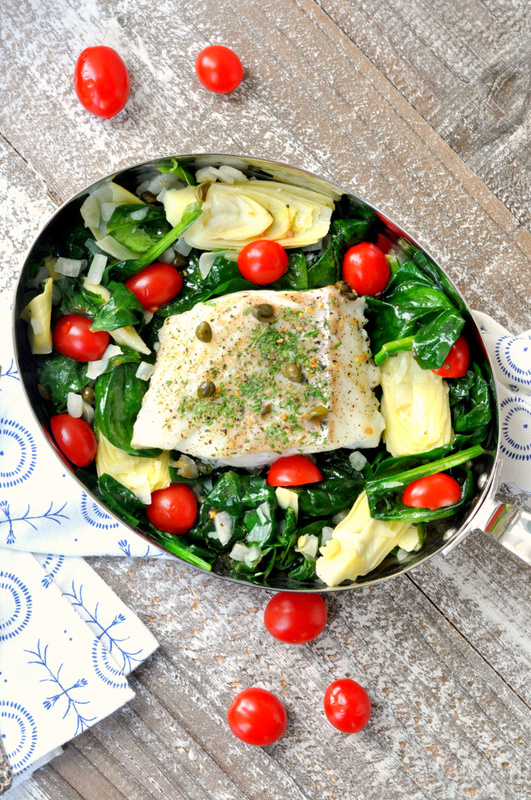 Either way you prepare this Mediterranean style Alaska cod recipe, just be sure you first look for Alaska cod when selecting your fish. It will make all the difference in the flavor and quality of your fish. 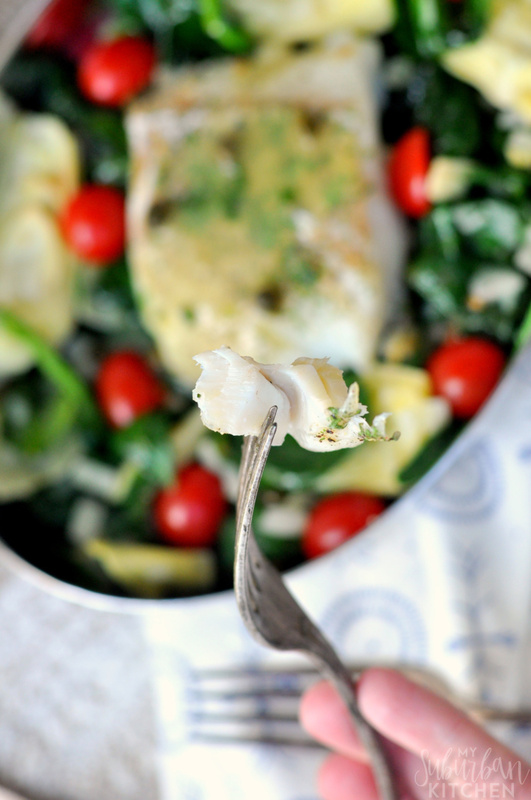 If you make this Mediterranean style Alaska cod recipe or any other recipe from the blog, I would love to hear about it. Share your experience in the comments or snap a photo and tag it #MySuburbanKitchen on Instagram or Twitter. 1. In a small bowl, whisk together melted butter, lemon juice and worcestershire sauce. 2. Preheat oven to 350 degrees. Lightly grease a baking dish. 3. In a small bowl, combine salt, pepper, oregano and parsley. 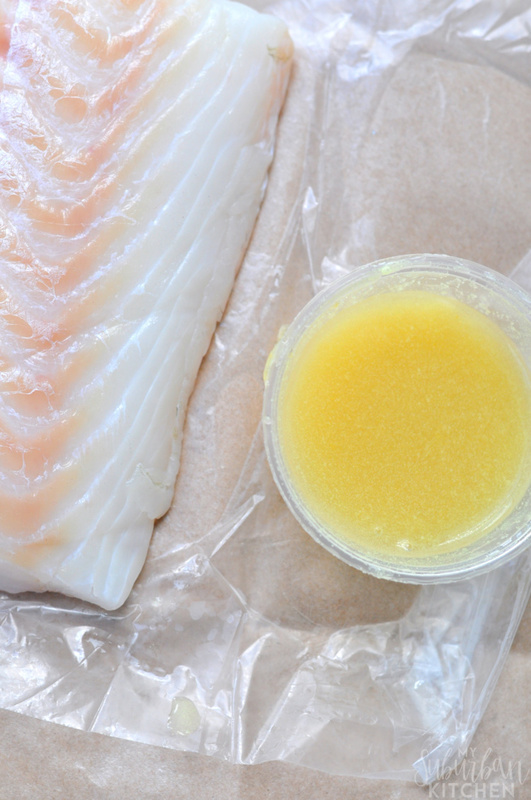 Season both sides of Alaska cod and add fish to prepared baking dish. Top each filet with 1 Tbsp of lemon butter sauce. Bake in preheated oven for 10-15 minutes or until fish is fully cooked. 4. While fish cooks, melt 1 Tbsp butter over medium heat in large skillet. Add onion and cook for 2-3 minutes. Add artichoke hearts and spinach and cook for 2-4 minutes or until spinach begins to wilt. Add tomatoes and 1 Tbsp lemon butter sauce. Cook for an additional 2-3 minutes or until everything is heated through. 5. Top spinach mixture with cooked Alaska cod. Pour remaining lemon butter sauce over dish and sprinkle with capers and fresh parsley. You can cook this entire dish in the oven if desired. Toss the vegetables with lemon butter sauce and layer under fish for baking. Bake covered for 10 minutes and then remove cover for remaining 5 minutes. This looks delicious. I am always on the lookout for new ways to eat fish. Thanks for sharing. What an incredible dinner idea! I love the combination of flavors and cod is my favorite! I was looking for different way of cooking fish rather than soy sauce flavour. Thank you so much for sharing the recipe. Mediterranean way to cook fish is definitely fresh idea that I would love to try. Thanks for sharing the recipe. This is definitely going into my collection. I love light, fresh fish recipes. I can’t get enough seafood lately. I’m eating your dish with my eyes. It’s gorgeous! Artichokes on a salad is one of my favorite things! Hey Shannah, I like this recipe, thank you. Wow…amazing recipe. Thanks so much for sharing! I put a little mayo on them to make it creamy. Huge hit in our house! Oh the mayo addition sounds wonderful!